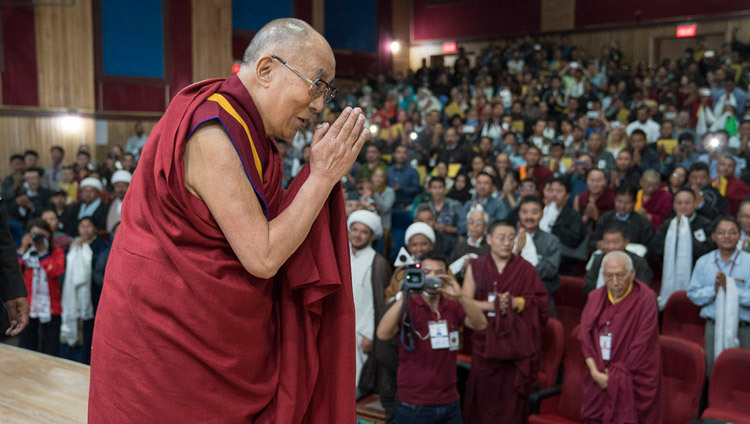 Leh, Ladakh, J&K, India – This morning His Holiness the Dalai Lama attended a Seminar in the auditorium of the Central Institute of Buddhist Studies on its spacious campus in nearby Choglamsar. The theme was ‘Communal Harmony – Foundation of World Peace’ and the occasion was a celebration of the centenary of the birth of the great 20th century leader of Ladakh, Bakula Rinpoche. The meeting had the further distinction of being organized by the Youth Wings of the Ladakh Buddhist Association (YWLBA), the Anjuman Imamia and the Anjuman Moin-ul-Islam. Arrayed along the back of the stage was an exhibition of photographs from the life of Kushok Bakula Rinpoche, which His Holiness viewed with interest. He then lit the lamp to formally inaugurate proceedings. In his introduction, Rinchen Namgyel, President YWLBA, explained that the 19th Bakula Rinpoche worked hard, particularly after Indian Independence, to bring all of the people of Ladakh together. He was the architect of modern Ladakh, an MP, and a social reformer, who popularized the promotion of communal harmony through education. He also oversaw the banning of animal sacrifice. Today, the state of communal harmony in Ladakh is an example for the rest of the world. Bakula Rinpoche is regarded as an emanation of one of the Sixteen Arhats, close disciples of the Buddha, who undertook to protect his doctrine. The 19th incarnation was born a prince of the Matho family. He went to Tibet, where he met the 13th Dalai Lama, studied at Drepung Loseling Monastery, and earned the degree of Geshe Lharampa. In 1949, at Pandit Nehru’s behest he entered parliament and began his work for the growth of Ladakh. He was very keen to improve education and was involved in setting up the Central Institute of Buddhist Studies, which was initially located at Spituk Monastery before being transferred to its present site. He also arranged for scholars to study in Varanasi and Sri Lanka. When he felt that Sheikh Abdullah, Jammu & Kashmir Chief Minister, was neglecting Ladakh, he challenged him. For all that he was a monk, Bakula Rinpoche maintained a strong secular ethos, which enabled him to serve as a leader of all communities in Ladakh. Later, he contributed to the restoration of Buddhism in Mongolia. When it came to His Holiness’s turn to speak, he addressed the gathering as brothers and sisters, telling them what an honour it was for him to be among them once more. He remarked that on his first visit to Ladakh in the 1960s he had met Bakula Rinpoche and many old friends, most of whom were no longer there. At that time Ladakh had not made much material progress. Since then, it has been transformed, with Bakula Rinpoche and others like Sonam Norbu having made a significant contribution. “It’s very good to remember what a difference he made here,” His Holiness continued. “In due course, Rinpoche also played a significant role in the development of Mongolia and the restoration of Buddhism there, especially in terms of discipline. “However, what’s past is past and now we have to look to the future. Generally, across the world, the beginning of the 21st century has been better than the 20th century. People have become fed up with violence and nurture a genuine desire for peace. I greatly appreciate the spirit of the European Union. At the end of the Second World War, the nations of Europe, after fighting each other for centuries, decided instead to work together for the common good. For sixty years since then peace has prevailed. “One of the big mistakes of the 20th century was the persistent attempt to solve problems by use of force. The world has become so interdependent, both in terms of our economies on the one hand and dealing with challenges like climate change that affect us all on the other, that such an approach is completely out of date. We need a new way of thinking to suit our new reality. We have to learn to live side by side. “Helping others brings deep satisfaction. No matter how powerful we may seem to be, our survival depends on the community. Clearly the community is crucial to individual happiness, so if we make others happy, we too derive benefit. We need to take action. However, if we act out of self-centredness, it will be difficult to be transparent, to earn others’ trust and friendship. By learning to be more warm-hearted we can create a more compassionate world. As members of Institutions like this you can make a difference here in Ladakh, in Jammu & Kashmir and in India at large. “We face a multitude of problems. But among them conflict in the name of religion is unthinkable and shameful. Such narrow-minded, short-sighted thinking is out of step with the times. We have to work with the welfare of the whole of humanity in mind. The organizers had gathered more than 50 written questions, which the presenters read out, asking those who had asked them to stand to identify themselves. A questioner noted that while religions invariably advocate harmony, the existence of faith schools seems to contradict that. 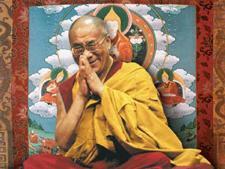 His Holiness asserted his belief that education should be secular. It ought to be possible to learn to be a good human being, to be warm-hearted, without necessarily touching religion. He said we can find justification for warm-heartedness in scientific findings and common sense. When asked his advice for the peace-loving people of Kashmir, His Holiness recalled first meeting Chief Minister Sheikh Abdullah at Nehru’s house in Delhi. At the time he thought there was an opportunity to resolve the problem, but it did not turn out that way. He observed that Gandhi had not wanted partition, but the price was for Jinnah to become Prime Minister of India, while Nehru cherished the same ambition. His Holiness recalled Vinoba Bhave’s advocating a greater unity among South Asian nations that might have provided the context for a solution. Conceding that he had no answer, His Holiness encouraged the young people who had asked the question to think carefully and formulate their own vision for achieving peace. His Holiness agreed that the Buddha had declared that caste and family background were of no importance in his tradition. It was instead knowledge and practice that deserved respect. He added that in an age of democracy and equality there is no place for caste discrimination, which is simply out of date. A representative of Christian Students offered words of thanks, expressing gratitude to His Holiness for coming and taking part, and to everyone else whose efforts had contributed to making the event a success. So many members of the audience wanted to shake His Holiness’s hand and have their photographs taken with him that his leaving the stage was slow. Eventually, however, he reached his car and was able to drive to the Sindhu Darshan Complex near Shey, where the LAHDC had invited him to lunch. Within sight of the River Indus that flows swiftly out of Tibet, Dr Sonam Dawa LAHDC CEC paid tribute to His Holiness as the honoured guest. After a group of Ladakhi musicians had played and sung, prompting His Holiness to voice concern about their sitting too long out in the searing sun, he offered only brief remarks. Once everyone present was replete, His Holiness returned to Shiwatsel Phodrang. Tomorrow, he will begin three days of teaching Shantideva’s ‘Guide to the Bodhisattva’s Way of Life’.